Join Anna Lisa & Rob, along with our musical friends, Norm Williams and Shea & Stan Zukowski, for the season opener at the Farmers Market. 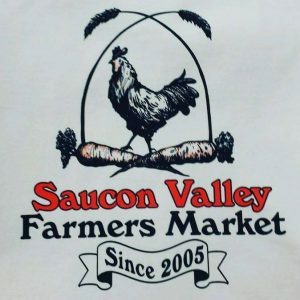 Saucon Valley Farmers’ Market offers the freshest seasonal produce and unique specialty products from local business every Sunday from May to November! The market is located at 90 W Water St., Hellertown, Pennsylvania. Check out the Saucon Valley Farmers’ Market website. 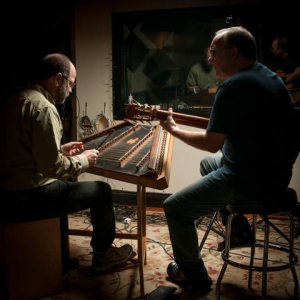 Cliff and fellow musician Brian Pearson form TACHYONMETRY, a hammered dulcimer and classical guitar duo, and they will be opening Perkasie Patchwork Coffeehouse on Saturday, April 27. Come out for a delightful evening of music at Patchwork, located at Perkasie Mennonite Church, 320 W. Chestnut Street, Perkasie, PA. Admission: $12 for adults; $10 for adults 65 and over; students 13 and up, $6; 12 and under free. All tickets sales at door, no advanced sales or reservations. The building is wheelchair accessible. The doors open at 7:00 and performances begin at 7:30. 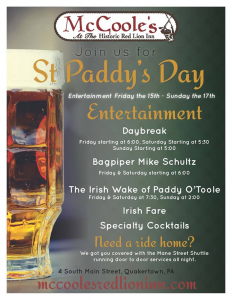 Friday, Saturday, & Sunday, March 15, 16, 17, 2019 – St. Paddy’s Weekend at McCoole’s! Join us for dinner & Irish music — call 215-538-1776 for reservations (recommended). 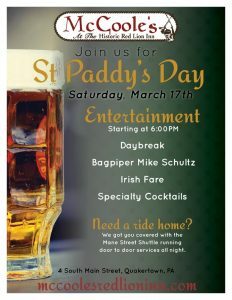 We’ve been playing annually for St. Paddy’s at McCoole’s at the Red Lion Inn, an historic Quakertown restaurant with a pleasant atmosphere & great food for reasonable prices. This year we’ll be playing all weekend with Cliff, Rob, Anna Lisa, and (sometimes) our friend L.A. Williams. Our scheduled starting times are 6pm Friday, 5:30pm Saturday, and 5pm Sunday with breaks now & then for a Celtic piper. We’ll play until our hands fall off, our strings break, or the crowd starts throwing tomatoes. This time we’ll be in the main restaurant dining area. It’s a fun time for us when we roll out all the many Irish pieces we’ve added to our repertoire over the years, from hither and yon. So “Banish Misfortune” and come grab a bit of that “luck o’ the Irish” with us if you’re able! The Dulcimer Boys (Cliff and Norm Williams) will be leading an old-time carol sing on the Christmas tour at Quiet Valley Living Historical Farm in Stroudsburg, PA . Even if you miss us there, please go to any show on the December 1st, 2nd, 8th, and 9th featuring our wonderful musical friends. The Dulcimer Boys (Cliff, Rob, and Norm Williams) will be joining other folk musicians for this seasonal celebration. 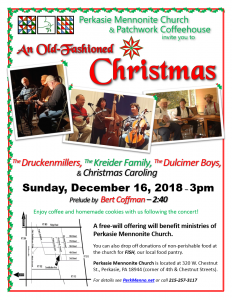 Perkasie Mennonite Church and Patchwork Coffeehouse invite you to An Old-Fashioned Christmas on Sunday, December 16, at 3 pm. Music by the Tom and Betty Druckenmiller with Norm Williams; the Dulcimer Boys and the Kreider Family. Rob Yoder will lead the audience in a Christmas caroling. A prelude of holiday instrumental selections on classic guitar by Bert Coffman will begin at 2:40 pm. A free-will offering will benefit the ministries of Perkasie Mennonite Church. You can also drop off donations of non-perishable food to be donated to Pennridge FISH, our local food pantry. Enjoy coffee and homemade cookies with us following the concert. Saturday and Sunday October 6 & 7, 2018. Open 10am to 5pm both days. Rain or Shine. Cliff, Anna Lisa, and Rob will be playing between 11am and 3pm at the annual Apple Butter Frolic held at the Mennonite Heritage Center, 565 Yoder Road, Harleysville, PA, with parking at Indian Valley Middle School, 130 Maple Ave., Harleysville, with a shuttle to the nearby Frolic. This popular autumn festival has been enjoyed by the local community for over 40 years. The Frolic is an opportunity to learn how Mennonites and their neighbors lived 100 or more years ago, and it’s great fun for young and old alike. It also raises important funds to support the mission of the Mennonite Heritage Center. The Frolic is a rain or shine event! There is plenty to do undercover if we have a shower. Cliff, Anna Lisa, and Rob will be playing at Quiet Valley Living Historical Farm for their Music in the Valley celebration. A bunch of us traditional musicians will be playing our music here and there around the farm. Come on out and enjoy this bucolic setting in the hills near Stroudsburg, PA. Rob will be presenting two workshops this year at Maidencreek. In the first, Rob and Norm Williams will introduce the student to methods of finding and singing harmony. We’ll talk a little theory and use familiar trad tunes to try out our developing skills. In the second, Rob will help students with techniques to find confidence in singing. Visit www.mcotmf.org for times and more information about the festival in Blandon, PA.
Cliff, Anna Lisa, and Rob will be playing at the opening day of the Saucon Valley Farmer’s Market. We’ll be sharing our music between 9am and 1pm . It looks like it should be a nice Spring day for the Market. Join us for dinner & Irish music — call 215-538-1776 for reservations. We’ve been playing annually for St. Paddy’s at McCoole’s at the Red Lion Inn, an historic Quakertown restaurant with a pleasant atmosphere & great food for reasonable prices. Personnel this yr. will be Cliff, Rob, Anna Lisa, Trudy, and our friend L.A. Williams. We’ll play from about 5:30 or 6:00 to 9:30 with breaks now & then for a Celtic piper. This time we’ll be in the main restaurant dining area. It’s a fun evening for us when we roll out all the Irish pieces we’ve added to our repertoire over the years, from hither and yon. So “Banish Misfortune” and come grab a bit of that “luck o’ the Irish” with us if you’re able! Hey! It’s a reunion. Cliff, Anna Lisa, and Rob will be joined by all of their now adult offspring for a concert at Perkasie Patchwork Coffeehouse. Trudy, Emily, Lydia, and Seth will come back from parts far and wide to join us for a great evening of folk music. We’ll play some of our old favorites as well as several new selections. It will be great to have the band back together. Sam Edelston, mountain dulcimer virtuoso, will warm up the crowd for us. Admission: $12 for adults; $10 for adults 65 and over; students 13 and up, $6; 12 and under free. All tickets sales at door, no advanced sales or reservations. The doors open at 7:00 and performances begin at 7:30.